Dr. Dana’s research encompasses three subthemes. The first is teacher leadership as experienced and new practitioners engage in inquiry and take evidence-based actions to promote student learning and school improvement. The second centers on the contexts in which teachers learn to teach and expand their knowledge of effective practice. The third is related to the study of specific groups of educators. In particular, Dr. Dana has studied the ways practitioner research plays out in the professional development of principals, as well as the professional development of K-12 virtual school educators. Dr. Dana has secured a grant from the Institute of Education Sciences (IES) to develop and study an extensive online professional development program for third through fifth grade general education and special education teachers focused on the teaching and learning of mathematics. As part of this program, teachers engage in practitioner research to target struggling mathematics learners in their classrooms. 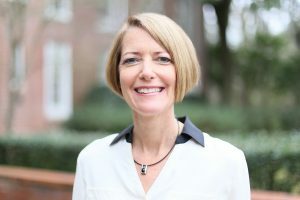 Dr. Dana has received numerous awards, including the Association of Teacher Educator’s Distinguished Research in Teacher Education Award, and has published ten books and over 80 articles in professional journals related to her research. Teacher Pedagogical Content Knowledge and Research-based Practice in Inclusive Elementary Mathematics Classrooms, ($1,533,653.00). Washington, DC: Institute of Educational Sciences. Dana, N. F., & Yendol-Hoppey, D. (2016). The PLC Book. Thousand Oaks, CA: Corwin Press. Dana, N. F., & Yendol-Hoppey, D. (2014). The reflective educator’s guide to classroom research: Learning to teach and teaching to learn through practitioner inquiry, 3rd Edition. Thousand Oaks, California: Corwin Press. Dana, N. F., Burns, J. B., & Wolkenhauer, R. (2013). Inquiring into the common core. Thousand Oaks, CA: Corwin Press. Yendol-Hoppey, D., & Dana, N. F. (2010). Powerful professional development: Building expertise within the four walls of your school. Thousand Oaks, California: Corwin Press. Dana, N. F. (2009). Leading with passion and knowledge: The principal as action researcher. Thousand Oaks, California: Corwin Press. Meyers, E., Paul, P. A., Kirkland, D. E., & Dana, N. F. (2009). The power of teacher networks. Thousand Oaks, California: Corwin Press. Dana, N. F., & Yendol-Hoppey, D. (2009). The reflective educator’s guide to classroom research: Learning to teach and teaching to learn through practitioner inquiry, 2nd Edition. Thousand Oaks, California: Corwin Press. Dana, N. F., & Yendol-Hoppey, D. (2009). Facilitator’s Guide to the reflective educator’s guide to classroom research: Learning to teach and teaching to learn through practitioner inquiry, 2nd Edition. Thousand Oaks, California: Corwin Press. Yendol-Hoppey, D., & Dana, N. F. (2007). The reflective educator’s guide to mentoring: Strengthening practice through knowledge, story, and metaphor. Thousand Oaks, CA: Corwin Press. Dana, N. F., Pape, S. J., Griffin, C.C., & Prosser, S. K. (2016). Incorporating practitioner inquiry into an online professional development program: The Prime Online experience. Professional Development in Education, DOI: 10.1080/19415257.2016.1152592. Dana, N. F., Marrs-Morford, L., & Roberts, S. (2015). The promise of action research: Lessons learned from the Indiana Principal Leadership Institute. LEARNing Landscapes, 9(1), 59-79. Jacobs, J., Yendol-Hoppey, D., & Dana, N. F. (2015). Preparing the next generation of teacher educators: The role of practitioner research. Action in Teacher Education, 37(4), 373-396. Dana, N. F. (2015). Understanding inquiry as stance: Illustration and analysis of one teacher researcher’s work. LEARNing Landscapes, 8(2), 161-172. Dawson K., Dana, N.F., Wolkenhauer, R. & Krell, D. (2013). Identifying the priorities and practices of virtual school educators using action research. American Journal of Distance Education, 27(1), 29-39. Dana, N. F., Krell, D., & Wolkenhauer, R. (2012). Taking action research in teacher education online: Exploring the Possibilities. In R. Hartshorne, T. Heafner, & T. Petty (Eds). Teacher education programs and online learning tools: Innovations in teacher preparation. IGA Global. Wolkenhauer, R., Boynton, S., & Dana, N. F. (2011). The power of practitioner research and development of an inquiry stance in teacher education programs. Teacher Education and Practice, 24(4), 388-404. Ross, D., Adams, A., Bondy, E., Dana, N. F., Dodman, S., & Swain, C. (2011). Impact of a cohort-based, job-embedded, blended teacher leadership program. Teaching and Teacher Education, 27, 1213-1222. Dana, N. F., Delane, D. C., & George, P. (2010). Reclaiming Camelot: Capturing the reflections of exemplary veteran middle school teachers in an age of high-stakes testing and accountability through narrative inquiry. In K. F. Malu (Ed.) Handbook of Research on Middle Level Education. Greenwich, CT: Information Age Publishing, 151-172. Dana, N. F., & Yendol-Hoppey, D. (2010). The role of inquiry-oriented learning communities and protocols in sustaining and enhancing teacher reflectivity throughout the professional lifetime. In E. G. Pultorak (Ed.) The Purposes, Practices, and Professionalism of Teacher Reflectivity: Insights for 21st Century Teachers and Students. Lanham, MD: Rowman & Littlefield, 277- 300. Dana, N. F., Tricarico, K., & Quinn, D. (2010). The administrator as action researcher: A case study of five principals and their engagement in systematic, intentional study of their own practice. Journal of School Leadership, 19(3), 232-265. Yendol-Hoppey, D., Dana, N.F., & Delane, D. (2009). Inquiry-oriented mentoring in the professional development school. School-University Partnerships, 3(1), 6 – 13. Dana, N. F. & Yendol-Hoppey, D. (2008). Resisting crash diet staff development, Kappa Delta Pi Record, 44(2), 66-71. Dawson, K. & Dana, N. F. (2007). When curriculum-based, technology enhanced field experiences and teacher inquiry coalesce: An opportunity for conceptual change? British Journal of Educational Technology, 38(4), 656-667. Dana, N. F., Yendol-Hoppey, D., & Snow-Gerono, J. L. (2006). Deconstructing inquiry in the professional development school: Exploring the domains and contents of teachers’ questions. Action in Teacher Education, 27(4), 59-71. Dana, N. F. & Yendol-Hoppey, D. (2005). Becoming an early childhood teacher leader and advocate for social justice: A phenomenological interview study. Journal of Early Childhood Teacher Education, 26(3), 191 – 206.